As I mentioned somewhere on my Summer’s Bucket List post, I started taking Beginning Sewing. Why? I have no clue. Maybe it was pinning together one too many of Dad’s sewing projects over the years, sitting at my grandmother’s antique sewing table rocking the stylized metal foot (is it a foot if it’s about 3′ x 3′?) back and forth or seeing my co-workers projects. Who knows? Now, I’ve sewn in the past. I’ve had my own machine (that I sold in a garage sale). I’ve made my own dress (singular) with buttons (go me), but I’ve never been formally trained. And since I’m apparently determined to be a jittery spaz that people pity in the writing group (embarrassed myself at the June meeting, too – good work), I clearly need some wins. So (with an “o”, no need for an obvious painful pun), my friend Kendra and I signed-up for Beginning Sewing at the Stitch Lab. It was truly a fantastic class with an awesome (and extremely patient) teacher, Hayley. I was drawn to this particular place, because each lesson ended with the students creating something. Ok, and to be honest, I really dug the fabrics they showed on Flickr (well, they’re really cool/fun fabrics). 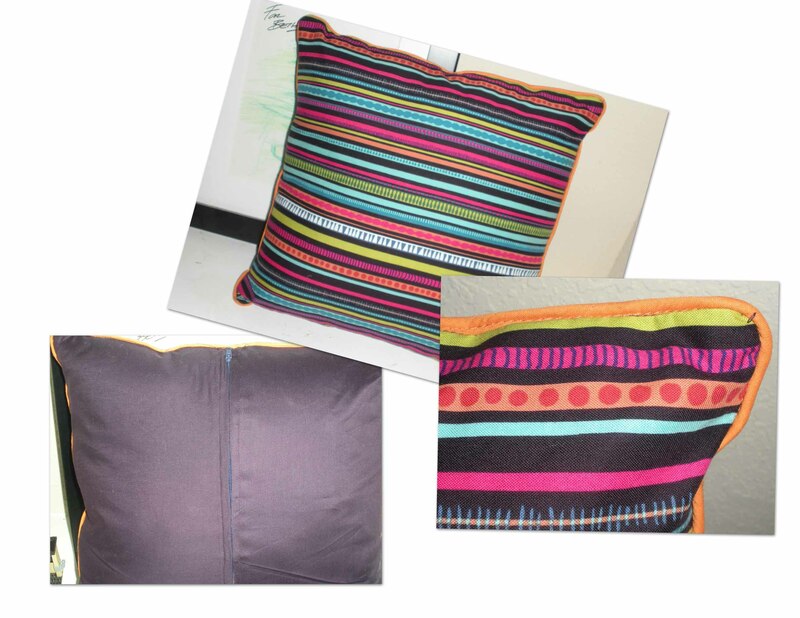 In the second class we had to create a decorative pillow. Let’s stop right there, I hate decorative pillows with a passion. When I say “with a passion” I mean I think they herald the fall of mankind and their continued existence burns a hole through my very soul. Sure, they can look “lovely” I suppose – possibly at someone else’s house, but other than collecting dust, and constantly needing to be fluffed and repositioned, I don’t care for them. HOWEVER, with that said, I made one (not much choice in the matter) and I have to say it kind of makes me stupid with happiness. In this particular class, we learned about piping and zippers (and the value of a good seam ripper – apparently, if the zipper cloth doesn’t go under the foot just right and the fabric wads up, you can have a bit of a nightmare on your hands – so I’ve heard). The third class – let’s just start by saying I was already enjoying a really bad weekend before I walked through the doors. I got to class early, suspecting I needed to purchase more interfacing for my project. (We got to choose one of several projects and since I wasn’t letting anyone near me with a tape measure to make a skirt and I didn’t need a fancier decorative pillow, because of the whole “fall of mankind” thing I went with the “messenger bag”.) As we were all laying out our material and looking at our instructions and patterns for our various projects, our instructor mentioned there had been some crying in a previous class. Inwardly I snorted. As a rule, I’m typically not a cry-er. In fact, it usually takes some major event to get me going (or an Oprah episode, ok or maybe the end of a good book, or that time Dr. Carson Beckett died on SG:Atlantis saving the entire station and really all he wanted that day was someone to go fishing with him, but I digress). I’m fairly certain it was the smugness in my “snort” that caused everything to go pear-shaped for me that day. It started with the fabric. Where I thought I didn’t have enough for interfacing, I actually didn’t have enough of the regular material, either. I realized this as I started laying everything out and ironing the pieces. This is where our ever-patient teacher consoled me and pointed out all the other fabrics available for purchase throughout the store. WHEW! I shopped around, picked out the fabrics I wanted and Hayley cut-out the right yardage. I was on my way to messenger bag-dom! But, I was now behind my classmates on the pinning and cutting. In fact, people were starting to sew before I had my piece pinned. Hayley to the rescue part 2 – Hayley began helping me cut and pin. Apparently, I chose a project that was a little more complex than the skirt or pillow and she tried to remind me that we had plenty of time. I wasn’t behind, she reassured, I just had more pieces. At some point when I was finishing off stitching a piece at the sewing machine, I turned in my chair to go back to the table for more pinning and that’s when the “snort karma” caught up with me to smack me in my smug face. The chair I was sitting in broke into three pieces and I unceremoniously spilled onto the wooden floor. (My knee and ego are still bruised.) I really can’t quite express how humiliating it is to be the oldest and the fat-est crawling around on the floor. I apologized profusely and proceeded to beat myself up – the odious fat beast on the floor – good one, Beth. Now, what the picture doesn’t show well is that the flowers are not really a yellow or gold, they’re actually a cheerful chartreuse. I’m kind of proud of this creation – my first messenger bag – produced from tears, banged up knees, bruised ego and a lot of patience on my instructor’s part. Bag in hand and with thirty minutes to spare, I headed to the car. The air let me know my pants were falling down. AWESOME DAY! This entry was posted in Me, Projects and tagged Friends, Kendra, Sewing. Susan – you were one of my major inspirations for giving this whole sewing thing a go with your skirt and boxers (and now your fancy Burda Style flowery jammies). 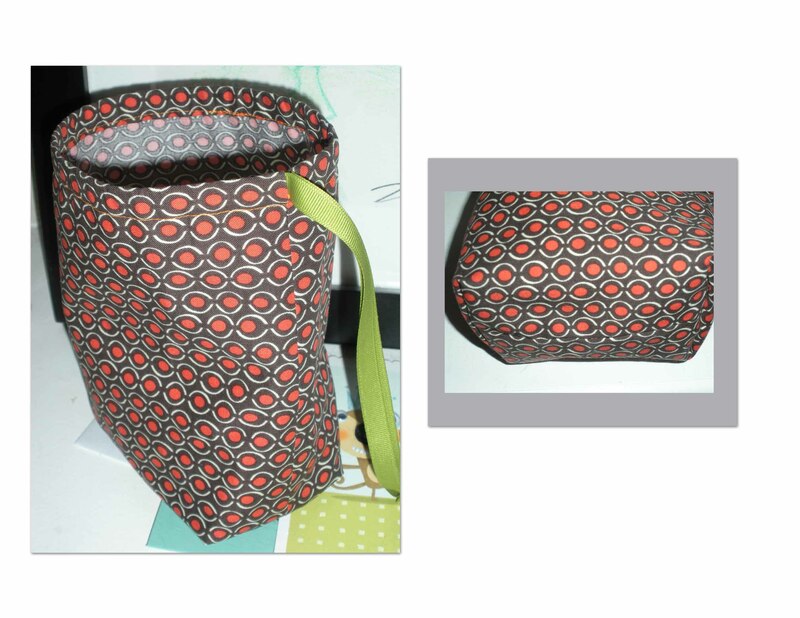 Next month I’m going to go to the reversible skirt class and then I plan to sign-up for the “make a purse” class. My goal is to be queen of the cloth purse/messenger bag. Minus the bruises and embarrassment, I really did have a good time. 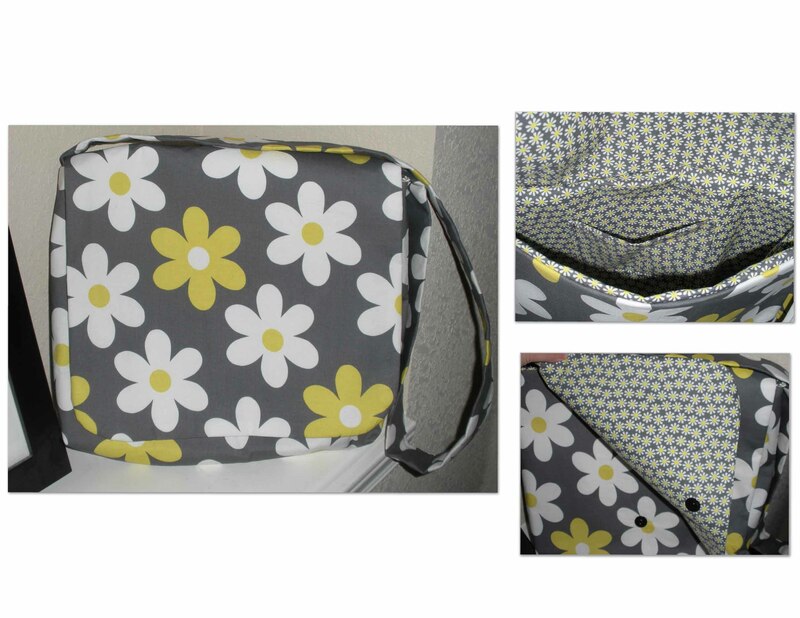 Super cute messenger bag! Love the fabric. And Dear Lord…the other stuff? Just let it go and try to laugh it off. If it makes you feel any better at all, a few years ago my chair broke from underneath me and I landed hard on the floor while sitting at the Thanksgiving table. Yeah…plate full of food and the big girl’s chair broke. Awesome. Maybe you should start an on-line Etsy shop and sell your bags!